Like most authors, you should be maintaining an author or book blog as well as have a presence on Facebook or Twitter, so you can engage your fans and keep them abreast of future releases, special offers, sneak peaks, ARC offers, etc. Here is the annoying part: That’s a lot of updating! 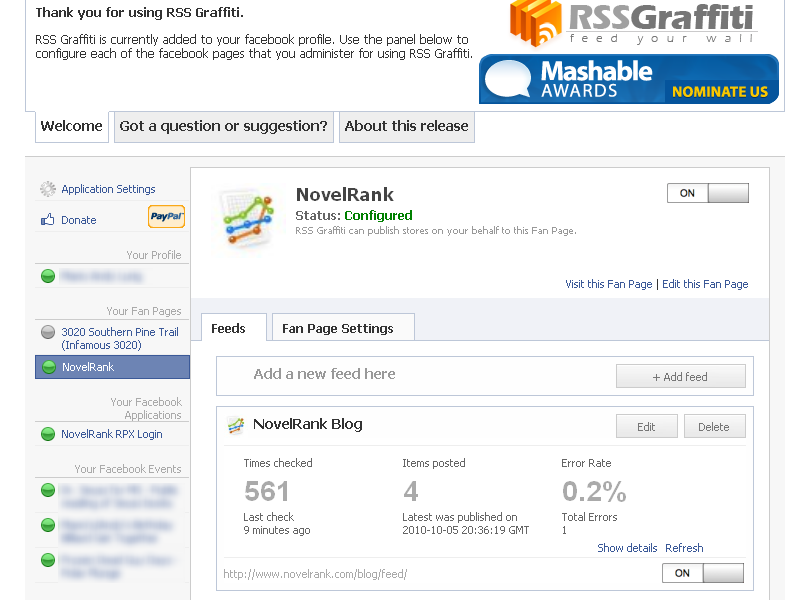 Much like NovelRank offers an easy way to track your sales rank and reduce your time commitment (so you can, you know, write), RSS Graffiti will take a post you make within your blog and link to it automatically. 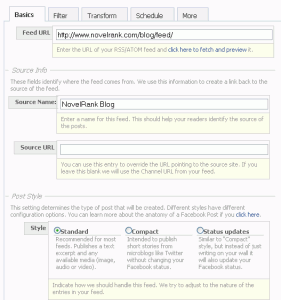 Every blog offers an RSS feed of your recent posts, and that feed is the key to this entire thing. 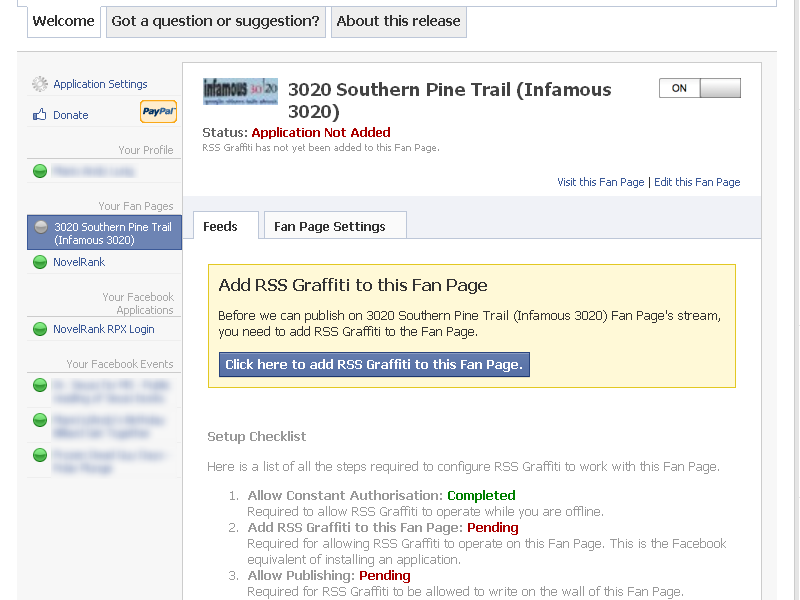 First, install the RSS Graffiti app inside of Facebook. 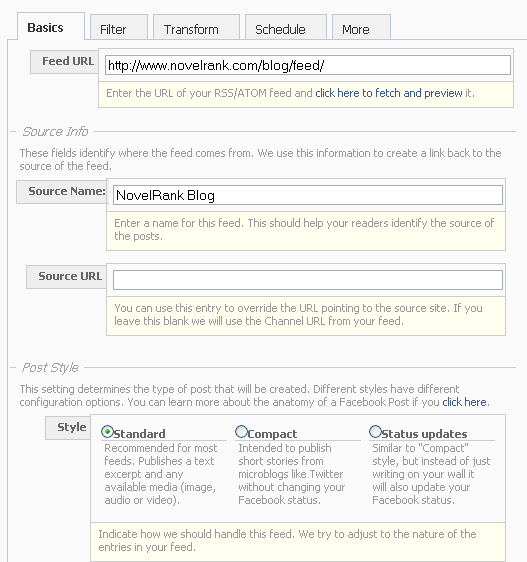 Second, find the RSS feed for your blog’s recent posts. If using WordPress, you will find the link usually at the bottom. Now it’s time for the magic! While there are multiple tabs with other options, the Basics tab contains the highest priority items. The only other recommendation I will make is to, under the Schedule tab, set the Update Frequency to ‘Four Times A Day’ if you update your blog only once a day or less frequently. Like with anything, play with the app a bit to make sure it does everything you want. It’s very well documented, so since you probably are not afraid of words, read about all the options. 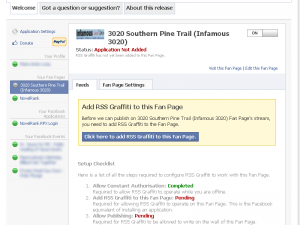 In the end, the goal is to simply post to your blog and let RSS Graffiti do the rest of the work for you! If you have an installed version of WordPress for your blog, then there is a WordPress plugin that you should already have installed: Tweetable. It will automatically post your new blog posts to your twitter account. That means software is doing all your social media marketing for you after you write a new blog post! 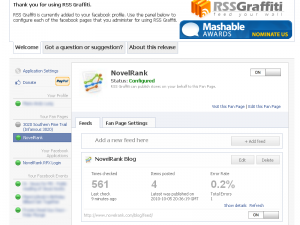 You know that NovelRank offers a sales RSS feed for every book, right? You could post those with RSS Graffiti to your facebook wall to announce your sales, but frankly… if you sell more than 5 books a month, you may annoy everyone. You’ve been warned. This entry was posted in Tips and Tricks and tagged facebook, rss, twitter on October 18, 2010 by Mario Lurig.